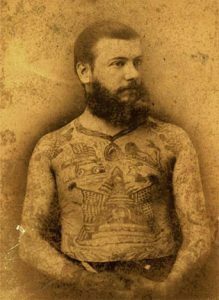 Martin Hildebrandt – one of the best New York’s tattooer started doing his “art” in 1856, while he was working as a sailor aboard the frigate. He was also noted during the Civil War. Hildebrandt marked thousand of soldiers. His tattooes later helped to recognize hundreds of soldiers after being killed. We know that Hildebrandt continued his professional activities at 77 James Street after war has ended. His new workplace was located in Lower Manhattan and looked like “a small tavern, with a sanded floor”. He was married to Mary Hildenbrandt, which gave birth to his son – Frank. Nowadays, Hildebrandt is also known as a man, who created “first tattooed lady”. She named herself as a Nora Hildebrand, but in fact was born in England and wasn‘t even related to Martin. Later, Martin have tattoed many other ladies, who then worked in many famous circuses. Soon The New York Clipper published last mention about Martin Hildenbrandt. According to it Martin Hildenbrandt – one of the best New York’s tattooer, whose wife is with circus, was sent to jail. It happened because of his son. who charged that his dad is insane and should be immediately transferred to an asylum. There are some publications about Hildebrandt online. The most famous of them are articles from The New York Times and The Chicago Tribune dating as far back as 1876. Unfortunately, even there i didn‘t find much information about when was born one of the best tattooers of all time. There wasn‘t even an official date of his death. While doing some research job we couldn‘t even determine in which part of lower Manhattan Oak Street was located. Why? Because nowadays there is no Oak street in Manhattan. But, after combing through some newspaper archives, we’ve discovered that Oak street located near Fourth Ward. Also by dint of historic city records we’ve finally located his official death certificate, which told us that he died in that horrible asylum. Ridiculous, but New York’s first professional tattooer ended up alone in such a horrible place, as Wards Island asylum is. However, we are honored to remember him, bring his story back to life and told you that this person made a huge contribution in modern tattooes!